Most dogs get very excited by the sound of car keys. I’ve had friends with badly trained dogs who’s only means of getting their dog to come when called was to shake their car keys. Riley isn’t quite so car-crazy, but he does love to sit in the back and keep on the lookout for any new dogs we might come across. He’s never been one to stick his head out of the window to sniff the wind, but maybe that’s because I am pretty careful not too open the windows too far. When I was a kid, seat belts were a novelty. We rode in the back of the station wagon with the rear window down, feet out the window, sucking in exhaust fumes as we sang B-I-N-G-O driving my father crazy. These days, things have changed and as parents we should be just as concerned about the health and safety of our fur units as our other children, right? 1. Seat belts vs crating? This will depend on your dog as well as your vehicle. If your dog is used to being crated and feels safe and sound while traveling in his crate, then that’s probably the best way to go. If you don’t use a crate in the car, then restraining your dog with a proper seat belt is essential. Even in a sudden stop or a minor collision, an unrestrained dog could be thrown into the dashboard, windshield, or even into other passengers. Excitable or fearful dogs have been known to escape through open windows or doors, which can put them in a very in a dangerous situation. And remember, you could be miles from home. Finally, an unrestrained dog is a distraction to the driver. The folks at canineauto.com have a great selection of restraints for most dogs and vehicles. 3. Heads out the window? Call me overly protective, but I do not let Riley stick his head out the window, unless we are driving in our own neighborhood at about 20 MPH. Yeah, lots of dogs love to do this and it’s fun to see, but think about how you would feel if your dog got hit in the eye with a piece of gravel or a rock that someone’s tire kicked up while driving down the interstate. Flying debris of all kinds can cause eye injuries, get stuck in ears, nasal passages or even throats. Or worse, your dog could be seriously injured or killed if he decided to jump from the vehicle if a cat or a squirrel took his fancy. Remember, just because your child likes riding with his head out of the window isn’t a good reason to let them do it, so why would you treat your dog any differently? The guys at howstuffworks.com have posted a great article about this debate. 5. Unattended in a Parking Lot? Would you leave your child in the car in the mall parking lot? I don’t know about you, but I always think twice about leaving Riley alone in my car. I have seen posters in local supermarket lots asking for help in finding pets that had been stolen from such cars. And while we’re at it, do I really have to remind you how quickly temperatures can rise inside a car on a hot day? Check out mydogiscool.com for some terrific advise. 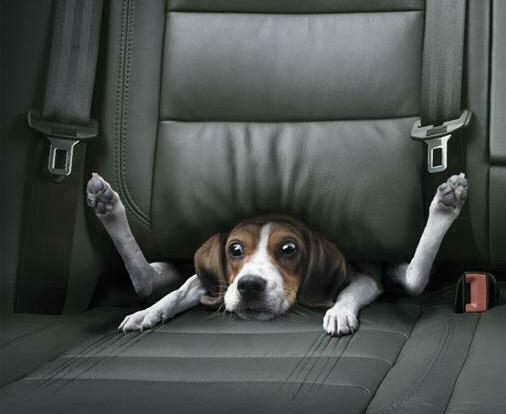 A little common sense goes a long way in keeping you and your dog safe and happy as you hit the open road. And remember, be sure to pack some treats and some water, along with your ScooPup Pocket, (the best poop scoop and carry bag there is) so that you can pick up after your dog if he needs to make a rest stop along the way. It’s hard trying to keep a nice-looking yard with just one dog, but with three active dogs running around, it can get pretty ugly. Not to mention tossing our rainy Seattle weather into the mix and having to wipe three sets of paws every time they come indoors. So, on Saturday we put down a new batch of “beauty bark” over the areas in the yard where the grass had seen better days. On tuesday night, Riley was very restless. Around 1AM, he had jumped up onto our bed and spent the rest of the night tossing and turning. Needless to say, so did we. At 4AM, I decided to see if he wanted to go outside for a pee, but he was reluctant to get off of the bed. When I eventually coaxed him down, I noticed that he was limping. Closer inspection revealed a small puncture in a front paw pad and the pad was a bit swollen. There didn’t seem to be anything lodged in the pad, but I couldn’t be sure. I put some antiseptic lotion on the area, covered it with a bootie and tried to go back to sleep. In the morning we visited our vet and he prescribed a dose of antibiotics*, just to be on the safe side. So, what caused the puncture? Was it something in the beauty bark? A thorn from a rose bush? Who knows. Paw pads are prone to injury and can be tricky to heal. Keeping the wound clean and covered when outside is recommended and can speed the healing. Wrapping the paw is tricky and it is essential not to apply the dressing to tightly. Since most dogs will tend to try to remove any bandages, I find that covering the paw with a dog bootie is the way to go. You can find an assortment of booties in pet stores and on-line. One good source is petboots.com. They carry a variety of booties for various needs, including specially designed protective boots in different sizes. For more information on caring for paw pad injuries, here’s a great blog called Dog Topics, which featured a post on dog paw care. *If your dog has been prescribed antibiotics, it is a good idea to add supplemental probiotics to their diet. I do it for myself when I have to take them, so why wouldn’t I do the same for Riley? You can read more about anti/probiotics in this informative article from thewholedog.com. My invention, The ScooPup Pocket, is a cleaner dog poop pick up and hand’s free poop carrier bag. Since I’ve talked about a cleaner way to pick up dog poop as much as I ever thought anyone could talk about a cleaner way to pick up dog poop, I often think about the possibility of manufacturing something else. People always tell me that while they may hate picking up their dogs, they do it. They also seem elated when I tell them that I’ve invented a cleaner way to pick up dog poop. Unfortunately, the amount of positive feedback that I get about my ScooPup Pocket is not matched in sales. I invented a cleaner dog poop pick up and and hand’s free carrier bag because I needed it. I thought it was a great idea. I’d buy one, wouldn’t everyone want one? Maybe a clever new dog toy would sell better than a product for picking up dog poop? Everyone buys toys for their dogs, right? Maybe not. Riley has a huge basket full of toys, but most of them were gifts from friends, re-gifted toys from the poodle down the street, or toys that I made for him myself. Here’s the thing: dog toys are expensive! I tend to buy those pricey toys only at Christmas. It’s silly I know, Riley doesn’t know the difference. As long has he has packages to open on Christmas with the rest of us, he’s happy. He doesn’t really care what they contain. Who needs to buy a paper shredder? 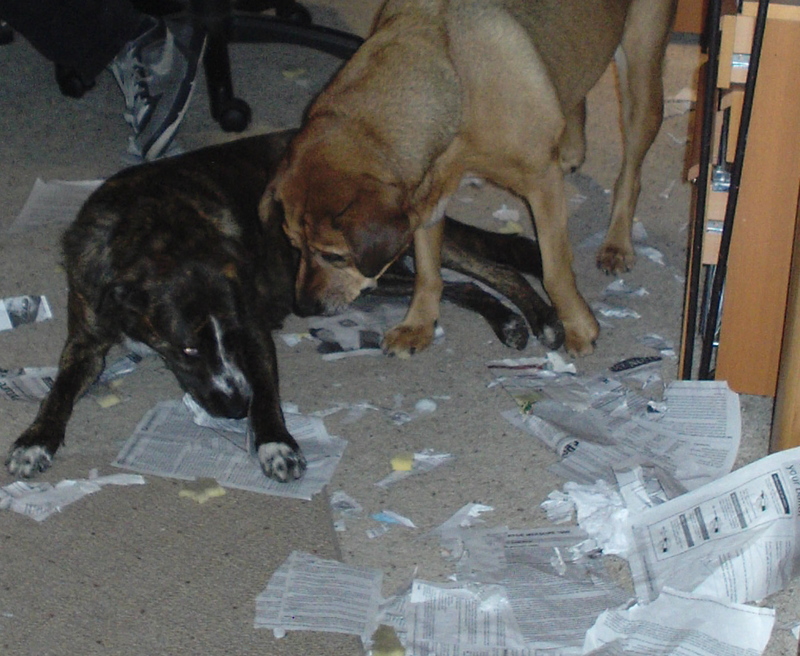 Riley loves to tear paper. Since he was little, he has loved to lay at my feet in the office shredding paper. He tears paper into little strips and spits them out. (I wouldn’t let him near the wastepaper basket if he was the type of dog who ate paper.) And he knows that the paper in the wastebasket under my desk is OK for him to dip into. Unfortunately, it took a little bit of him getting it wrong first. When he was young, one of the very first times I left him alone and uncrated he chose to rip through two chapters of fitness guru Kathy Smith’s book “Moving Through Menopause.” Frankly, at the time I had read just about all I had wanted to read on the subject, so I probably rewarded him for his editorial work. Since Riley is also a curious dog, one of the things that I do to keep him from getting bored is to hide treats inside some kind of paper product. I save things like paper tubes from the kitchen and empty cardboard boxes of various sizes that can become puzzles for him to solve. I also use envelopes and let him figure out how to get to the treat sealed inside. Old socks make teriffic pull toys. Socks with tennis balls knotted inside them are even better. If you’ve got two old socks and two tennis balls, try this: stuff a tennis ball down into the toe of each sock, then twist and pull the sock back over the ball again. Knot the sock at the base of the tennis ball and tie both socks together. This makes a great tug-of-war toy for two dogs, or a really good calf-smacker, if your dog is the type who likes to shake his “prey” back and forth and you weren’t quick enough to get out of the way. Cousin Mookie, girlfriend Sydney and Riley take a break from Tug-of-War. By the way, have you heard that tennis balls might not be the best thing for your dog to play with? You can find a lot written on the subject on the web, but here’s what I’ve found in a nutshell: Tennis balls are abrasive enough to wear down teeth, but unless you have a 24/7 tennis ball chewer, veterinary dentists say don’t worry about it. It’s also true that they may contain a certain amount of lead, but again unless your dog is addicted to them, I wouldn’t stress about it. There are other things that dogs may chew that can be more worrisome. Anything that you can’t bend can risk a fractured tooth. Until Riley cracked a tooth chewing raw bones, I was a big believer in raw bones for as the best tartar removing tool. You could have eaten off of those teeth. Oh well. I guess it’s time to invent a combination tarter-cleaning-pull toy that can also be used as a better way to pick up dog poop? You’d buy one of those, right? Well, I might be a day late, but the winner of the GABE contest is Creekhiker! 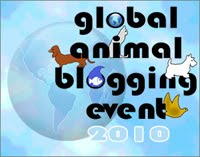 For those of you who are unaware, GABE stands for Global Animal Blogging Event. FYI, the winner was chosen by the completely unscientific “pull a name from a hat” selection. Everyone who added a comment to my blog was included in the drawing. For those of you who entered and are emotionally distraught that you are not the lucky winner of a ScooPup Pocket, (the greatest dog poop pick up and carry bag ever invented), I will be offering free shipping to anyone who uses the coupon code GABE at tinygrowl.com through the end of this month. Remember, when you purchase a ScooPup Pocket, not only will picking up after your dog on your daily walks be cleaner and smarter, one dollar from every ScooPup Pocket purchased is donated to animal welfare charities that are making a difference in the lives of animals in need, particularly dogs. Thanks to everyone who participated, and to those who took the time to checkout our website, and who became friends of Tiny Growl on facebook. Health Insurance For Your Fur Baby, Are You Crazy? 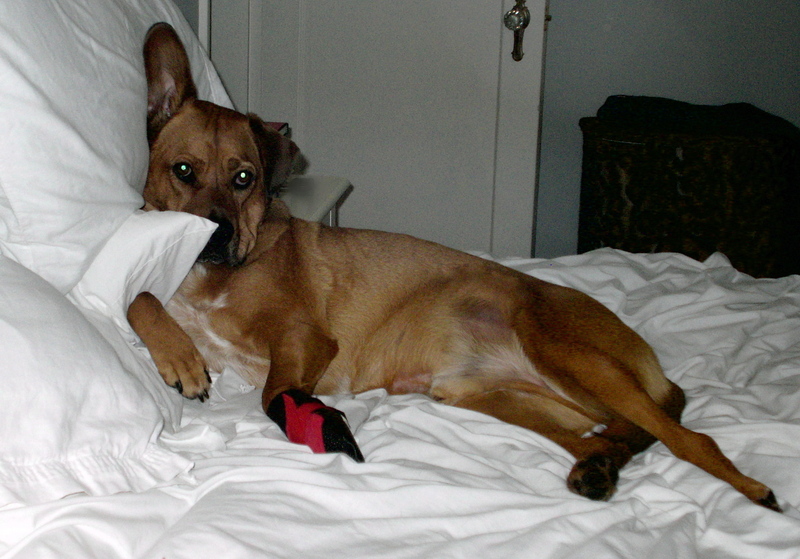 Anyone who owns a dog knows that there are thousands of pet products on the market today. One of the best pet products that I’ve purchased which has a direct relation to my pet’s health is our pet insurance policy. Lots of people think it’s crazy to have health insurance for insurance for a dog, but it’s been one of the best pet accessories that Riley has. 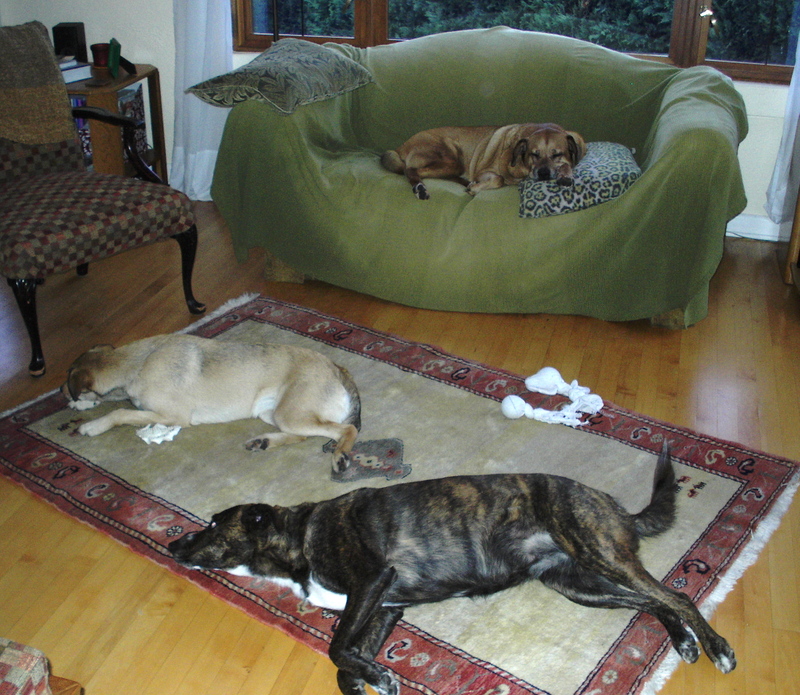 As recent article in The New York Times put it “a health crisis, in dogs or in humans, can arise out of nowhere”. I know from experience that this is absolutely true. The cost of our policy is a bargain, compared to my own health insurance, and it’s a small price to pay for the peace of mind that it brings. If we were faced with an extremely costly bill from our vet, I’d feel better knowing that we would be more able to cope with the expense and would not have to be forced to make decisions about Riley’s health based primarily on the cost of treatment. After all, he is a member of the family and everyone in this family is lucky enough to still have health insurance. So, you can debate the pet health insurance issue all you like (talk amongst yourselves), but let me tell you about a couple of dogs who’s owners saved a bundle because they had insured their pet’s health. (And their pets have gained a little bit of notoriety in the process). VPI Pet Insurance began their Hambone Awards last year and invited people to vote for the “most outrageous pet health insurance claims filed”. The winner was given the first annual Hambone Award. 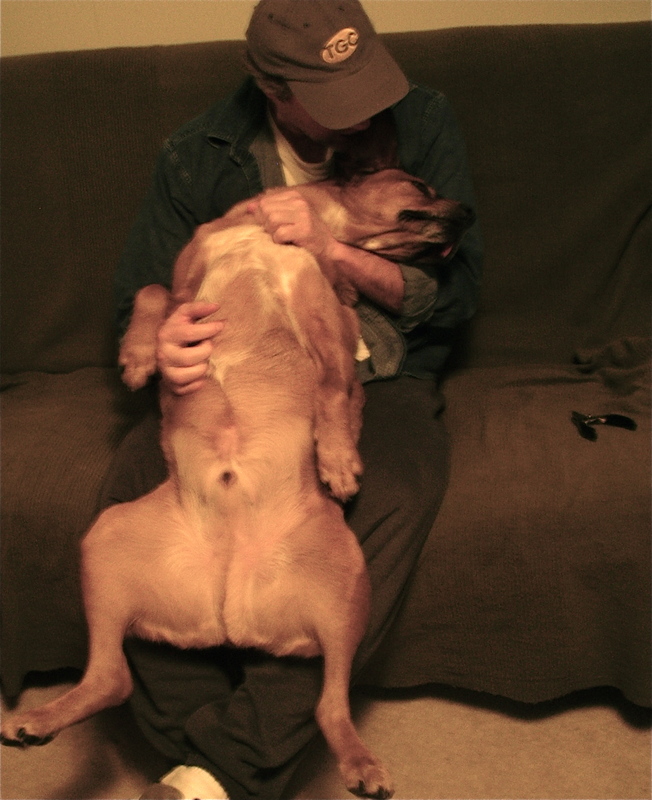 The nominees and their veterinary needs ran the gamut from “freak accident” to “freaky dog”. There was Roscoe, a standard poodle from Montana who had gotten into the trash and ate some plastic bottles and a couple of diapers. Aubie, a Border Collie from Alabama, who’s “affection” for the mail man caused him to shatter a pane of glass in the living room window. Jojo, a Boxer from Florida who, while playing ‘catch the car’ lost his tooth in a (thankfully, slow-moving) delivery truck tire. And Rock, a Lab from Minnesota, who managed to eat 23 packets of instant breakfast powder. You know those labs, no one ever would ever call them picky eaters. But my favorite, and the 2009 Hambone Award winner is Lulu, an English Bulldog from Montanna, who’s vet helped Lulu’s owners figure out the “Mystery of the Disappearing Baby Pacifiers”. After catching Lulu in the act of gobbling up their baby’s dropped pacifier, her owner immediately took her to the vet. X-rays were unclear, so the vet decided to perform surgery. 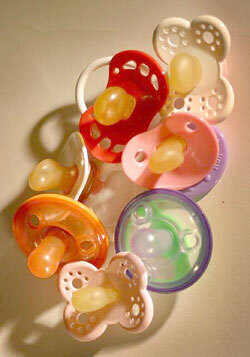 They found the pacifier alright, along with 14 more, a bottle cap and a piece of a basketball. So, if your dog is accident prone, or just plain nuts, maybe thinking about health insurance for your dog isn’t so crazy after all. You might just gain a little peace of mind and your pet might become an award winner. Ok, maybe it’s not for Best In Show, but please. Let’s remember that while dogs might prefer hambones, some four-legged hambones might eat just about anything. From what I hear, most dogs seem to hate having their toenails done. Some are pretty tolerant, others are willing participants. And then there’s Riley. Riley is a really great dog with a very sweet nature and he trusts me completely. Ever since he was a pup, I let him know that I was the boss, but that he had nothing to fear from me. I have always made it a point to keep on top of his toenail trimming. Since I have hardwood floors, it’s pretty easy to hear when it’s time for another trip to the futon in the downstairs rec room, which has become the “toenail spa” in our house, for some reason. Riley willingly climbs into my significant other’s lap (knowing, of course, that there will be treats to come) and then gets very relaxed, to the point of going into what looks like a doggie trance. I know some women who claim that getting their nails done is a very zen-like experience, but I’m not one of them. I never thought that my dog would be. Did you know that one of the best reasons for keeping your pups’s toenails nicely trimmed is to prevent joint pain? Dogs were made to walk on their pads, not their toenails. Walking on nails that are too long will cause their toes to spread and stretches the ligaments in their legs. This changes the alignment of their feet and legs and puts undue stress on the joints and muscles. And long toenails can’t grip hard, slippery floors. Older arthritic dogs may be afraid to simply walk across the kitchen, if they are fearful of falling. An older dog with a reduced sense of proprioception (the body’s ability to sense where it is in space) may feel that the world is a little less secure under their feet, which could effect their balance and their desire to exercise. Letting nails grow too long will also cause the quick to grow too close to the end of the nail. This will start a vicious cycle, since trying to cut the nail back too close to the quick will hurt, making the dog reluctant to have the nails trimmer and making you worry about attempting it again. If you find yourself if this position, it’s best to not try to trim the nail back all at once, but to give the nails small, frequent trimmings. This will cause the quick to recede. For a really great website with clear directions and pictures on trimming your pup’s nails, visit Washington State University’s College of Veterinary Medicine’s website. In my quest to find customers for my business, I attend as many dog-related events as a vendor that I can. These events are a great way to spread the word about my unique dog walking accessory the ScooPup Pocket (the best way to pick up and carry dog poop there is), but they are also a great networking opportunity. Last fall, I met a number of interesting groups who were also vendors at Dog-O-Ween, a benefit for Seattle’s COLA (Citizen’s for Off Leash Areas). Now you might imagine that vendors at these events are selling collars and leashes, or food and treats or other pet accessories like mine. But, these events can attract all kinds of dog-friendly businesses, as well as animal advocacy groups. Their service animal program provides people with disabilities the resources they need when considering getting a service animal or if they are currently partnered with a service animal. According to their latest newsletter, they site a study which indicated that heart attack patients had a 6x greater chance of survival a year later just by returning home to their dog or cat. Some people have been able to cut back their pain medication when a therapy dog is part of their physical therapy sessions. Visits from therapy animals have also been credited in helping patients come out of comas.